Getting Out of Debt: Freeze It: Pain Relief and a Sleeping Aid! 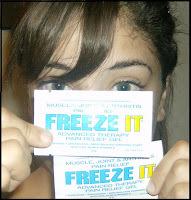 Freeze It: Pain Relief and a Sleeping Aid! I was lucky enough to have the opportunity to test a new product and give my honest opinion. Before I go into the product review, I need to explain something. I've been very ill since April. The antibiotics that I was prescribed have not cured my ear infection. The steroids have not reduced the inflammation I have on my sternum. The past couple of weeks, I've been dealing with fevers, aches and pains and dizzy spells. I called my doctor in July and I was given an appointment for August 14! I'm lucky that I have a high tolerance for pain (I have given birth to 5 children and I raise two others, you know). Anyway, I received a package from PayPerPost and it contained a product called Freeze It. It came in handy. I was using Blue Ice and Ben Gay for the aches and pains, which are similar products. Here's what I have to say about Freeze It! What was my experience with FREEZE IT? The first thing I noticed was the way it felt. It was slimy or oily. Freeze It went on like lotion. The next thing you notice is the scent. It doesn't smell like medicine. It is really strong and is effective especially if you are suffering from a cold. On top of all that's going wrong, my allergies are driving me crazy. I noticed the penetrating vapor cleared my nasal passages right away. Once I put it on, it started working right away. You can feel it heating up your muscles. It actually felt like a massage. After I used the gel, I was able to lay down and fell asleep without all the discomfort I was feeling. I actually slept better than I had in several weeks. What makes Freeze It different from similar products? Freeze It is made with natural ingredients. It consists of Aloe, Vitamin E and ILEX (am extract from a South American holly shrub). It also contains menthol and camphor for pain relief. Unlike other products, it didn't dry out my skin. They also come in a roll on form. As far as I know, there aren't other products like that. Today I was telling my younger sister about Freeze It. She was diagnosed with MS last year. (My doctor will be running tests to rule that out as a possible cause of my symptoms.) I was explaining the great results I had with the product. A product that helps you sleep better without medicating you! That alone is worth the $9.99 price tag!